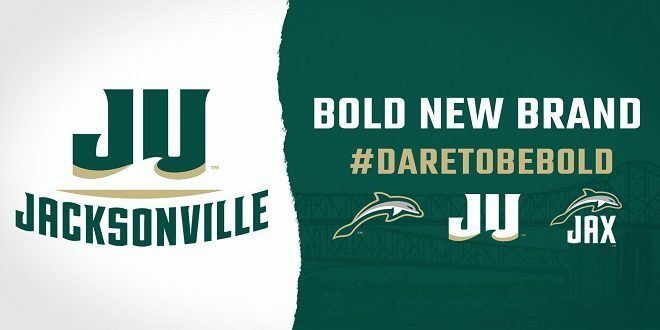 Tuesday, Aug. 28, the Jacksonville University Athletics Department unveiled a fully re-imagined brand identity. 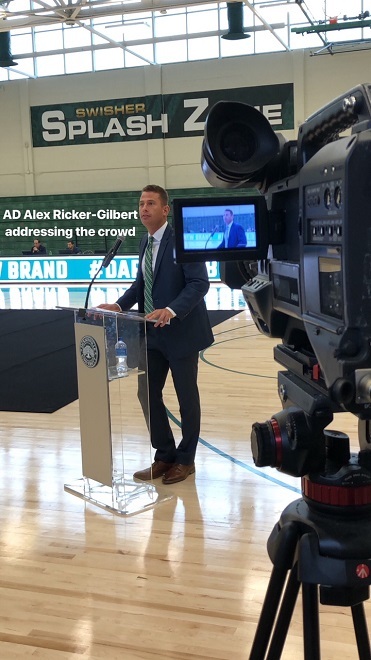 The crowded event was live from Swisher Gymnasium with Senior Vice President and Athletics Director Alex Ricker-Gilbert and Sr. Vice President of Marketing and Communications Scott Bacon serving as JU’s number one brand ambassadors. The result of a two-year process, the new Dare To Be Bold brands were publicly released, culminating in the unveil of the primary logo on the floor of the historic Swisher gymnasium. The University’s Athletics Department, representatives from across campus, and external constituents collaborated to develop the logos and word marks. Working tirelessly to ensure the new marks also came with a fresh branding mentality, Bacon expressed to all gathered the intent to bring the entire Jacksonville community together. Hearkening back to a long and storied sports history, the University challenges student-athletes to leave a legacy of their own. Today’s unveil and following pep rally officially marked the beginning of a new era in Jacksonville Athletics. Student-athletes sporting the new logos joined event attendees en masse to celebrate. Giveaways and invites to JU’s on-campus bookstore and online apparel store rounded out the festivities. For additional coverage from News4JAX.